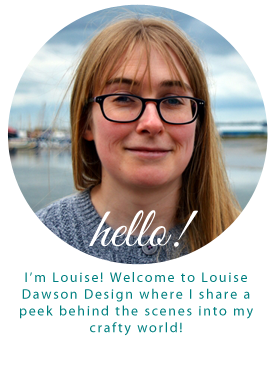 Louise Dawson Design: Last Christmas Posting Dates, a Christmas Sale and New Year Plans! Last Christmas Posting Dates, a Christmas Sale and New Year Plans! Hi all, I just wanted to let you know that the last posting date for UK orders is Thursday 18th December and if you would like to place an order for a Christmas gift or as a treat to yourself, I am having a Christmas sale and offering 25% off all orders in my Etsy Shop until 17th December! Use the code CHRISTMAS2014 at the checkout for 25% off your order! I'm looking forward to getting stuck into new projects in the new year- I've got lots planned that I'm looking forward to sharing with you, including a fresh new look for the blog!